Our widest known product 'Get Waisted' Body Cream from Mio Skincare. Formulated with Rhodofiltrat Delessaria™, Oat Protein Complexes and pharmaceutical grade caffeine, the Body Cream helps to replenish moisture to improve the look and feel of skin. 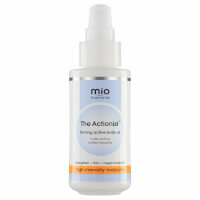 Apply 1 pump daily and massage into skin using large clockwise motions. I've never been big in to using moisturiser but since buying this I've religiously stuck to using it and can actually notice a difference. My skin feels a lot more taught than previously - would definitely recommend! When I first started using this product it was also in conjunction with my workout and better eating but I definitely noticed a difference in my tummy's tonedness as well as my family. I have loose skin from having a baby and by no means did it disappear but I felt it actually helped diminish the look of it! Having been working out I took a break from the product and though I have still been eating healthy and working out this is what has been missing! Within a week I noticed the difference again. It gives that added look that just smoothes things out! I will definitely be keeping this in rotation. After the 30 days of use, using it a couple times a week keeps the results and the bottle lasts quite a long time! I used Get Waisted last summer along with eating healthier and increasing my ab workout..although I had done this with success before, I had never added Get Waisted to my routine..What an amazing difference! Not only did I get my skinny tummy back, but the skin tightened up amazingly! You do need to keep using it to keep this look, but less often once you've achieved the results..great product! Using "Get Waisted" regularly, I definitely noticed tighter skin on my belly- even after three c-sections. I tried a similar product from Bliss, and it did absolutely nothing. I'm sticking with "Get Waisted" from now on! I was skeptical on this product, but bought it based on how much I love other products in this line. I found this one on sale, and took the plunge. Two weeks later, with this being the only change to my fitness/health routine, my waist become 1.5" smaller! I have been (and continue to be) a very active person, exercising 6 days a week (2 days of weights, other days for HIIT and basic cardio, and nightly with Yamuna body rolling). Recovery from my workout has been a problem, hence the protruding belly resulted (from high cortisol). I eat very well and healthy and follow guidance from a nutritionist. Fast forward to this new addition to my routine, et voila! I have assistance from "above" the skin. It still don't sleep/recover as well as I should, but despite this I managed to loose inches that seemed like I would never drop. I think the secret also lies in the mode of application. I apply it in a way that supports lymph drainage by rubbing on my lower back and moving the cream along my hips toward my abdomen. I then gently move the cream down thigh (where a major lymph drainage point exists). I use my knuckles to move the cream downward from the lower half of my stomach to those lymph nodes. A previous reviewer mentioned the smell. It smells ...shall we say...different upon application, but the smell goes away. I think this is worth trying, and when you do... apply it in a way that supports the lymph system. I'm confident that you'll see results. I've used this product for a little over a year. Love it, but the newly revamped version has a funky smell. The yummy smell permeates underneath the initial smell of "wet dog". Hope they can remedy this, but works great.